Most surface ice on Mars is temporary. The polar layered deposits are thick stacks of permanent water ice at each pole, and the South Polar residual cap may be a permanent (although dynamic) layer of carbon dioxide ice. However, at lower latitudes, seasonal frost (mostly carbon dioxide, but some water ice) comes and goes each year. Some outliers of water ice are found near the North Polar layered deposits. In many cases these have accumulated significant thickness, as in Louth Crater. In this case, a thin layer of bright frost was visible in a HiRISE image in early summer, covering part of the wall of a crater. However, the thickness was small—there is little visible effect on the topography of the crater. HiRISE monitored this location through the rest of the season and found that the frost remained all summer, so this is a perennial ice patch, although the edges shrank slightly over the summer. Carbon dioxide is not stable under summer conditions, so this is likely a patch of water ice. It may be that it is in the early stages of accumulation, or that the equilibrium amount of ice in a small crater relatively far from the pole is thin. 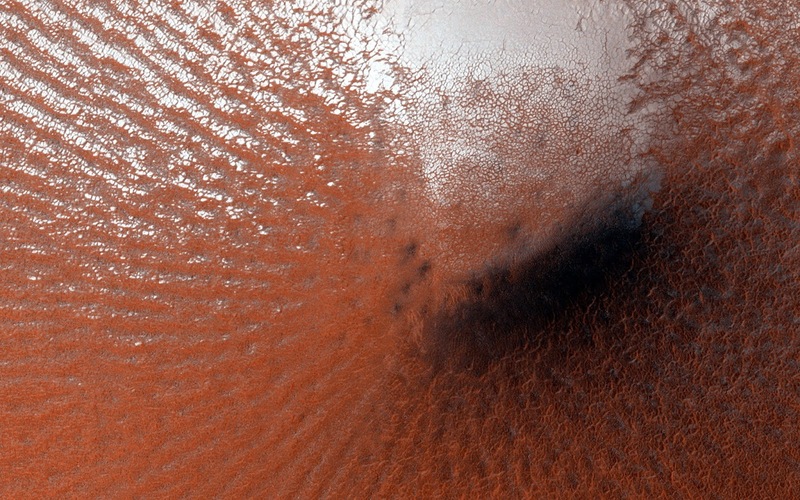 A still-unexplained feature of this crater is the diffuse dark smudges visible on the crater floor. These resemble “defrosting spots” which are visible on carbon dioxide ice in the early spring, but they occur on frost-free areas and survive throughout the summer. Note: This crater is located in Vastitas Borealis to the southwest of Korolev Crater. For more information, see PIA18832: Perennial Frost in a Crater on the Northern Plains.